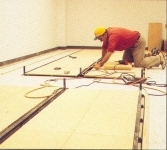 Our earliest systems installed in the 1970's and 1980's had steel carriages and all wood shelving. 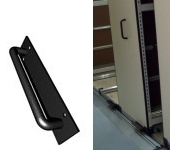 In the 1990's we introduced our special metal shelving for Golf Bags. Since then, our ALL METAL system has been the most popular choice with Golf Pros. 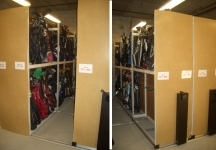 We still offer our classis wood shelving for Golf Bag Storage but we recommend our All Metal Systems that come with a full 10 Year Warranty on Parts and Labor (Labor is included on our warranties where we do the installation). No other source even comes close to our warranty and longstanding reputation for quality and durability. 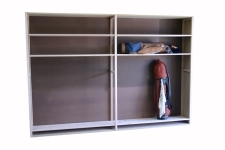 We recommend our All Metal Shelving System for Golf Bag Storage, but we still offer wood for those clients that want to match existing or prefer the look and feel of wood. 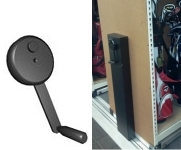 Standard and available only on our metal shelving. Or you can install our system! 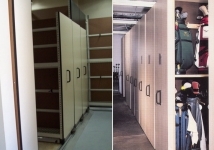 All storage systems are custom designed for your specific space. 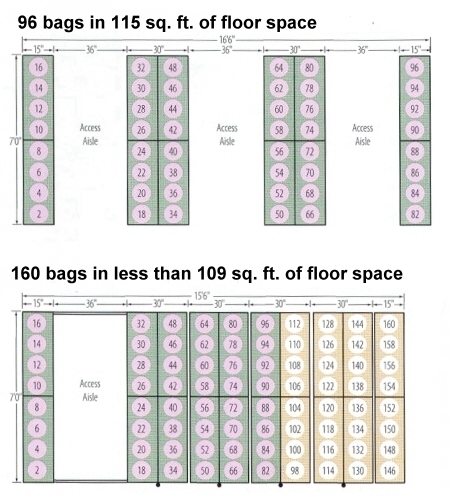 We have hundreds of component size options to tailor a bag plan that meets and exceeds your specific storage needs/requirements. We typically use 42" and 48"wide sections as they will hold 4 bags across. 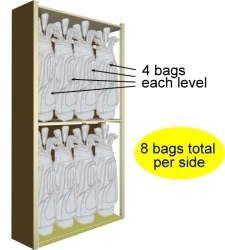 Using two levels within each section means a storage count of 8 bags per section. With some of today's larger bags, our 48"wide selection may often be the best choice. We always use a 15"depth. This will accommodate all of today's Golf Bags, but we do have other depths available if needed (12", 15", 18" and 24"depths). 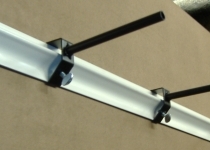 The standard height on our metal system is 96"high. Because our metal system is "Open Shelving" (Meaning no top shelf), you have more flexibility for storing the longer clubs. 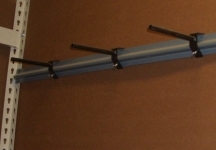 Since the middle shelf is fully adjustable you can set it to have a 50", 52", 54" up to even a 60" clearance (or more!). Your only restriction will be the height/clearance of your ceiling. We suggest having a minimum ceiling clearance of at least 104". 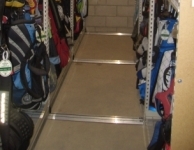 All shelving is installed at an angle so your bags are tilted against the back wall. The standard height on our wood system is 100"high but we also offer a 108"height and even 120" if needed. 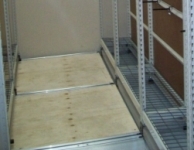 Our wood system does have a top shelf for dust protection.